It seems like every other day there's a new security threat or data leak in the news. Whether it's your credit card PIN or your smartphone's apps leaking your email address, no one wants their personal information out there, especially passwords. And if you use the same email address and/or password for more than one site, the effects of someone getting hold of your credentials can be catastrophic. Want to know if you've ever been the victim of a leak? There's a site called PwnedList that checks your email address to see if any of the accounts associated with it have been part of a leaked password list. It's the same tool that LastPass uses in its Sentry program to help users find out faster when their information has been compromised. It's really simple to use. Just go to the website and scroll down til you see a box where you can enter your email address. When you click Check, PwnedList checks your email address against its database of leaked credentials and lets you know how many times you're on the list. 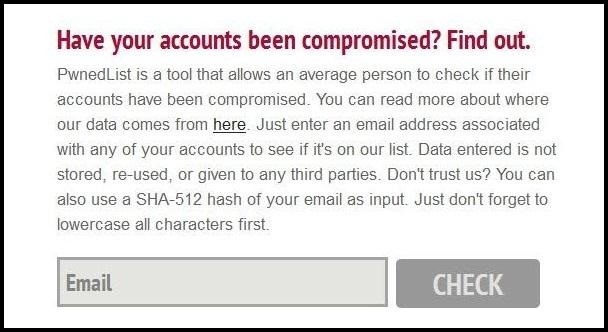 If the partnership with LastPass isn't enough to make you trust them, you can use a hash generator to give a SHA-512 hash of your email address instead. If you find that you are on a list (or several), the best thing you can do is change your password. A positive result doesn't necessarily mean you've been hacked, it just means it could easily happen. If you use the same email address and password for all your accounts (which you shouldn't), you'll want to change them all immediately. For tips on coming up with a secure password, check out some of our tutorials. Did anyone check their email on PwnedList and find a nasty surprise? Let us know in the comments.